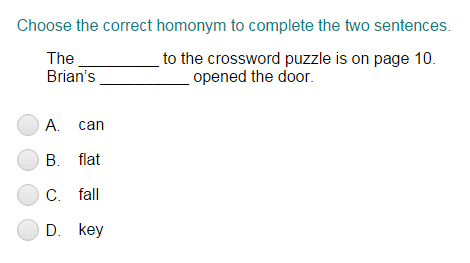 What did you think of Using the Correct Homonym to Complete Two Sentences Part 1 ? Homonyms are words that sound the same and are spelled the same, but have different meanings. a. The mother liked to rock her baby before putting him to bed. In this sentence, the word “rock” is a verb, telling us something that the mother does. b. I found a round, smooth rock in the river. In this sentence, the word “rock” is a noun, naming a thing we found in the river. c. I enjoy listening to rock music. In this sentence, the word “rock” is an adjective, describing a type of music.